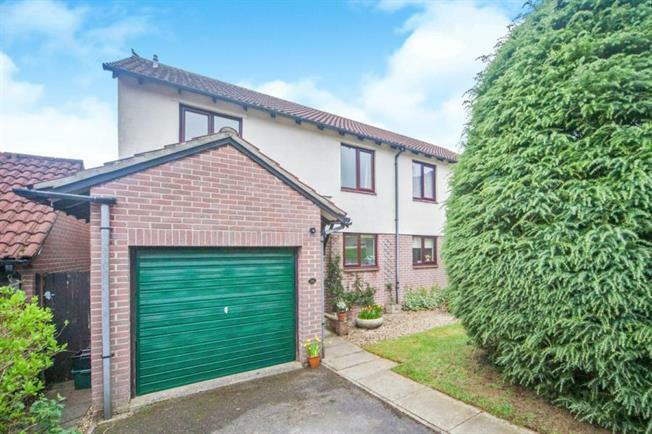 4 Bedroom Semi Detached House For Sale in Wells for £290,000. NO ONWARD CHAIN! A recently updated four bedroom semi-detached home, situated in a well regarded, quiet cul-de-sac with impressive far reaching views to the rear. An attractive hall way greets you that provides access to all other rooms on this floor. The downstairs WC has a window to side to compliment the white two piece suite. The kitchen is fitted with a range of wall and base units, that offer space for additional appliances and a built in oven and hob. There is a window overlooking the front garden and driveway. The living/dining room is an excellent size, with an abundance of natural light afforded by the large window and patio doors, which also allow for a lovely view! The landing provides loft access and access to the four bedrooms and the bathroom. The bathroom now has an upgraded walk-in shower, WC and wash basin. The master bedroom boasts a gorgeous view and built in wardrobes. Bedroom Two and Three will comfortably take a double bed. Bedroom Four is a single bedroom, that could be used as a study or a playroom if needed. The single garage is integral, accessible from the entrance hall and could be converted into an additional living room if required. The driveway provides off street parking for two vehicles. A secluded, West facing garden perfect to build a sun tan from, or for a spot of al fresco dining on the large stone paved patio.